New York City celebrates Gay Pride each June (June 21 to June 26, 2016), to honor what many consider to be one of the foremost events in the history of lesbian and gay rights, the Stonewall Riots, which commenced early in the morning on June 28, 1969. Also, be sure to consider some of the New York Pride events that take place in neighboring boroughs, such as Queens Gay Pride (early June), Brooklyn Gay Pride (early June), and Staten Island Gay Pride (mid-July); Harlem Gay Pride, which takes place the same weekend as NYC Gay Pride in upper Manhattan; as well as Jersey City Gay Pride (late October) and Newark Gay Pride (in mid-July) across the Hudson River in New Jersey. Also note that less than two hours north of Manhattan, the Hudson Valley region has several Gay Pride events, including Rockland County Gay Pride in Nyack (mid-June), Big Gay Hudson Valley Pride in Poughkeepsie and Dutchess County (early June); Hudson Valley Gay Pride in New Paltz, Woodstock, and Kingston (early June); and Hudson Gay Pride in Columbia County (mid- to late June). In New York City, Pride celebrations typically center around several events held at the end of June, starting with Family Movie Night on Tuesday, June 21. The major parties and celebrations take place over one big weekend, from Friday, June 24 to Sunday, June 26): the main events are the Rally (the earliest of the events, taking place on Friday), Teaze on Saturday; and PRIDEfest, The March, and the Dance on the Pier all taking place on Sunday. The events mostly take place in the West Village, very close to the city's other gay-popular neighborhoods like Chelsea and the East Village. Here's a more detailed preview of 2016 NYC Gay Pride. Also check out the official NYC Gay Pride Events page, which has details and ticket information on everything that's taking place throughout the week. On Monday, June 20, there's OutCinema at SVA Theatre in Chelsea, with a pre-release showing of Strike a Pose. And on Tuesday, June 21, Family Movie Night is set to take place at Hudson River Park, Pier 63. This year's featured film hasn't yet been announced, but doors will be opening at 7:30, and the movie commencing at dusk. There will also be performers entertaining the crowds. The Pride Rally takes place at Pier 26 in Tribeca, which you access by crossing West Street at Laight Street. This free event is held Friday, June 24, from 7 pm until 9:30 pm. There will also be some great entertainers performing for the crowd. On Saturday, June 25, Teaze, NYC Pride's official women's dance party, takes place as well at Hudson River Park on Pier 26 in Tribeca. Performing at Teaze this year is Grammy-winning pop star Mya. This thumpin' dance, featuring the music from top DJs, starts at 3 pm on Saturday, and lasts until 10 pm. There's typically an official Women's After Party taking place afterward - details are to be announced. Also taking place on Saturday is the VIP Rooftop Party - this crowd-pleasing party will again take place at the swankily renovated Hudson Terrace Rooftop Garden Lounge and Salon and Garden Terrace, at 621 West 46th Street, which is by the Hudson River, a half-block from the Intrepid Sea, Air and Space Museum. It begins at 2 pm and lasts until 10 pm. Enjoy entertainment by top DJs. Later in the evening, there will likely be an after party, with details to follow. The March commences at noon on Sunday, June 26, at 5th Avenue and 36th Street and winds its way downtown to the intersection of Christopher and Greenwich streets. 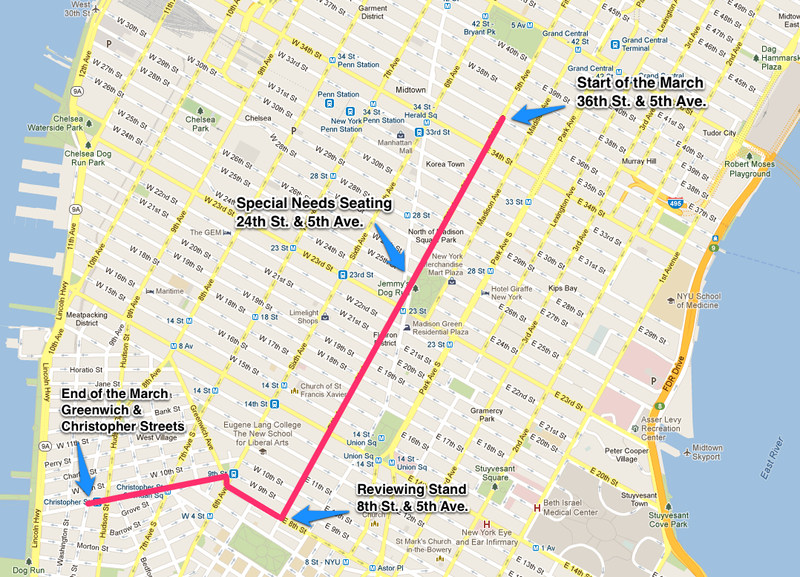 Here's the official NYC Pride Parade route map. This is arguably the must-see event of Gay Pride in New York City, drawing thousands of spectators. PRIDEfest is also held on Sunday, June 26, from 11 am until 6 pm along Hudson Street between Abingdon Square and W. 14th St., at the junction of three great neighborhoods, Chelsea, the West Village, and the Meatpacking District. Here's an official PRIDEfest map. The festive (and free) GLBT street fair features dozens of vendors, entertainers, and community organizations. The always-festive Dance on the Pier provides a grand finale for New York City Gay Pride, and this year pop sensation Fergie is performing. Thousands of GLBT revelers and friends congregate on Pier 26 in Tribeca, reached by crossing West Street at Laight Street) following Sunday's Pride March, from 3 pm until 10 pm. It's one of the great gay Manhattan parties of the year, featuring some of the city's best DJs and typically a top-name performer or two. Countless gay bars, as well as gay-popular restaurants, hotels, and shops, have special events and parties throughout Pride Week. Check local gay papers, such as Next Magazine, Odyssey Magazine New York and the Gay City News for details. And be sure to check out the helpful GLBT website produced by the city's official tourism organization, NYC & Compancy.